Join the discussion on our forums! Come discuss Priest of the Feast over in our dedicated Priest of the Feast discussion topic. Another card that should not exist. Remember when this card was frowned upon on the forums and called useless, and yet it is most likely one of the strongest priest cards and one of the best common of all cards? I knew it was great from the beginning. The immature community was just sulking about Purify and didn't wanna admit that Priest got a very good card. 2 very good cards. Onyx bishop is above average value if it brings back any thing with a total of 5 stats and it becomes insane if you can get a really big minion back. Also, purify isn't that bad if you build the right deck for it. I'm currently climbing ladder with an otk purify priest and its a bit of a hit and miss at the the moment but it is pretty spectacular if you can pull off the combo. When you queue against a braindead discard zoolock that just annihilated you and this guy comes in to serve your revenge. Also, don't forget to rope every turn. Y'all came into Karazhan thinking Blizzard had given up on Priest because of Purify, but PotF and Onyx Bishop made Anduin and Tyrande the real winners of the adventure. Control Priest is back, baby! 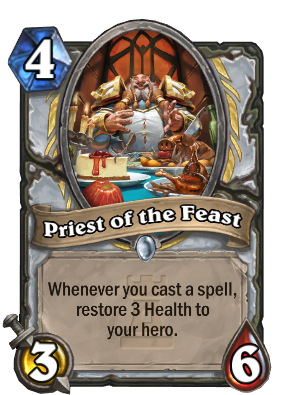 "FEAST OF THE PRIEST BEGINS NOWWWW....COME LITTLE BROTHERS"
I hate this card so much. It makes Priest unkillable. To make matters worse, once you kill him, Onyx Bishop shows up and brings him back! At least for me this card turned out to be better than expected, especially against Zoo and Hunter. Now I only need Yogg, Barnes and Onyx Bishop and I'm going to play Priest for days.